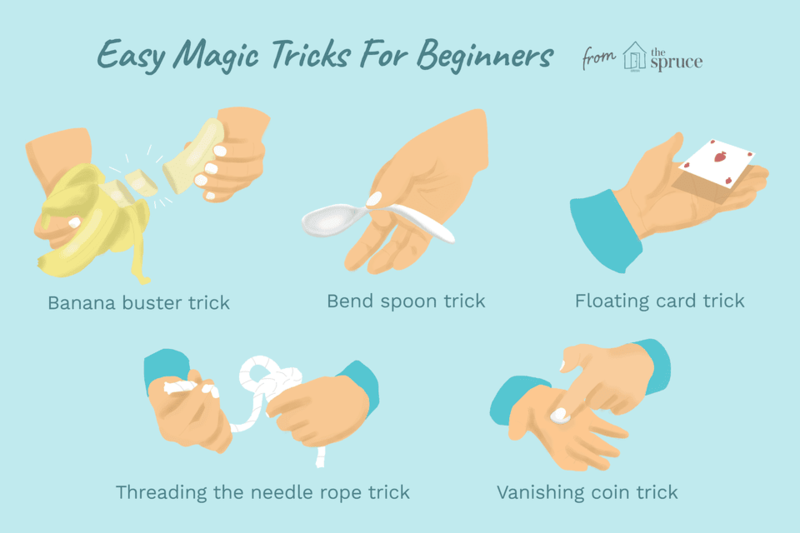 Easy magic tricks for beginners. Do you want to impress your friends with a few easy magic tricks? Whether you're an adult or a kid, it's fun to learn these illusions using cards, coins, or some other simple objects. The Spoon Bend is a classic trick that every smart-aleck needs to know. 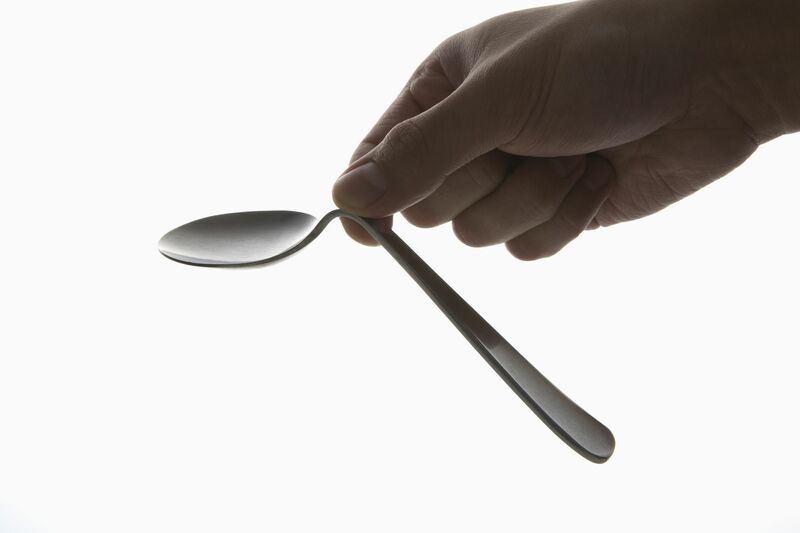 You grab any spoon, press down on it with your hands and appear to bend the spoon. As your stunned spectators register what you just did, you lift up the spoon and show that it is unbent, just as you found it. Here's a magic box that you can make to produce ribbons or a small handkerchief. It's a fun construction project and the trick is easy to learn and perform. It's the perfect trick for a kid magician to perform in her first magic show. The magic tube is as much a craft project as it is a magic trick. This is a particularly good trick for kids since it uses ordinary household materials. The magician shows his audience an empty tube and then magically produces items such as ribbons or silk handkerchiefs from within the tube. Here's a great trick where a magician apparently and quickly threads a piece of rope through a rope needle. It's easy to learn and perform and all you need is a length of rope and some talent for sleight-of-hand. After showing that a pencil sticks to your hand as you grasp your wrist, you suddenly let go of your "grabbing" hand and the pencil mysteriously stays in place. Notice the wristwatch in the photo? It's key to the success of the trick (but don't let the audience in on it). This trick makes it appear like the magician can make a coin disappear. The props for this trick include a couple of rings and a playing card. It requires a little bit of pre-construction but is probably suitable for kids (with a parent's help for the younger magicians). In the impassable corks, you hold two wine corks that are seemingly interlocked, and somehow pull the corks through each other. It's a fast, visual trick that you can also perform with rolled dollar bills and other objects of roughly the same size as wine corks. This trick is probably too difficult for younger magicians, but is a good option for older kids and beginning adult magicians. Defying the laws of physics in the cold as ice trick, water appears to instantly freeze. The magician pours some water into a cup, utters the secret or magic words, turns over the cup and finds a chunk of ice where the water should be. With a little setup, this trick is an easy one for even the littlest magician. Here’s a stunning levitation where you cause a playing card to mysteriously float from one hand to the other. There’s some crafting involved and you’ll have to watch your lighting and clothing and distance, but we’ll talk you through the process. Here's a magic trick that is sure to get the attention of spectators. You bring out a playing card and then cause it to spin in midair and then rise up to your hand. Learn how to perform the magnetic hand. In this mysterious and visual trick, you somehow cause several playing cards to adhere to your hand as if it were a magnet. Here's a cool trick where you cause a playing card to slowly rise above your hand and mysteriously turn at the same time. Here's an easy magic trick where you make it appear that you have punched a hole in a bill with a pen, but the bill magically restores itself or was never punched in the first place. A spectator's selected card mysteriously changes colors from the rest of the cards. Want to make something float in mid-air? You can when you learn the Levitating Ring trick. Here, a finger ring that's resting on a pencil mysteriously levitates on its own. Learn how to perform the Vanishing Toothpick trick. In this easy magic trick, you cause a toothpick that you're holding in your hand to vanish in a flash. In the end, you're holding your fingers wide apart. The Rising Card you have a spectator select a card and then lose it in the deck. You rest your first finger on top of the deck and as you lift your finger, the spectator's card mysteriously ascends with it. This should get a rise from spectators. Here's an easy way to deal yourself a Royal Flush in a seeming demonstration of poker. It requires more talking and misdirection than card handling skills. This is a great one to perform with your friends after a game of cards. That Thumb Thing is an age-old trick that you can do anytime, anywhere. In an instant, you seemingly pull your thumb apart and then put it back together again. If you're an uncle or grandpa, you have to learn this trick to tease the kids. In the Rising Ring, a ring that's threaded onto a rubber band mysteriously rises on its own accord. This one is super easy and all you need is a rubber band and a ring. There's almost no preparation. In the Jumping Rubber Band,​ a rubber band mysteriously jumps from your pinkie and ring fingers to the first and middle fingers of the same hand and then back again. All you need is a rubber band.